Without le Carré, would we have The Americans? Everybody's work is different . . . When my book group met a couple of weeks ago, we decided to take on John le Carré's latest, A Delicate Truth—and for purposes of comparison, because his latest has received mixed reviews, the book that made him famous, 1964's The Spy Who Came in From the Cold. We don't normally assign ourselves two books at a time, but then we don't normally read authors whose newest novels are their "latest." If the word suggests a formula at work, it also suggests—or all but guarantees—a novelist who knows how to write a book readers won't want to put down. "'I mean, you can't be less ruthless than the opposition simply because your government's policy is benevolent, can you now?'" The Spy Who Came in From the Cold lowered the temperature of the cold war by squeezing the idealism out of it. It popularized the idea of a rough moral equivalency between the two sides. Maybe the communists were evil and we weren't—that notion never went away—but we were good guys who did evil things to keep the evil guys at bay. Thanks to le Carré, two years after the Berlin Wall went up the cold war ceased being any sort of ultimate face-off between Good and Evil—a face-off that could only end one way, in the apocalyptic battle that lunatics, some in high places, were baying for. Le Carré redefined the cold war as an elaborate and deadly game played by their cynics and our cynics; and because cynics, even if they don't care who else gets hurt, have no intention of getting hurt themselves, he made the world feel safer. When Spy concludes, the book's sympathetic characters have been done in by its cynics; but if this was how the cold war actually was waged, then it was a game that could go on being played for years to come at little risk to the earth. The cold war ended when the iron curtain collapsed in 1989; the new FX series The Americans is predicated on le Carré's vision of it. It doesn't argue for moral equivalency; it takes it for granted. 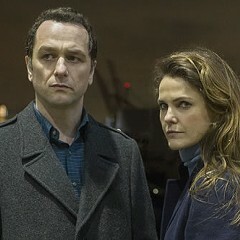 The Americans isn't played for laughs, but it's a period farce. The era is the early 80s, when Ronald Reagan was dreaming his big dream of Star Wars and the USSR was out of money and steam. A single true-believing ideologue in a big role would bring The Americans to a screeching halt, but no one like that is to be found. Nice people do terrible things but only because it's in their job description. All anyone really wants is a hug. 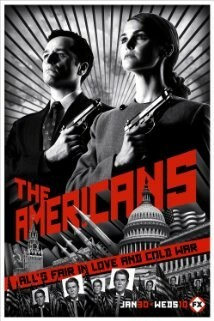 Like The Honeymooners, and Desperate Housewives, The Americans is a show about neighbors. Philip and Elizabeth Jennings are a middle-class couple living in a Washington, D.C., suburb, running a travel agency, and raising two bright and attractive kids. Across the street live Stan and Sandra Beeman and their bright, attractive son. Everyone puts up a brave front, but both marriages are under enormous stress. The Jenningses are Soviet agents paired and trained for years in Moscow and inserted here in what we must suppose is deep cover—except that the way they run around each week in wacky disguises kidnapping and killing, you wonder what's protecting them but the show runner. Stan Beeman is an FBI agent assigned to track down the two KGB operatives—a man and a woman—who are running around kidnapping and killing. Beeman is an extremely soft-spoken, even-tempered man, but when push comes to shove he does what needs to be done—such as shoot a captured KGB suspect in the back of the head. Beeman's neglecting the home fires. He's always at the office, his wife is fed up, and he has, frankly, strayed: he's become emotionally entangled with a comely young employee of the Soviet Rezidentura whom he's blackmailed into feeding him information. But the Beemans at least are in the familiar situation of having a normal marriage that's falling apart. Philip and Elizabeth are good parents, good spies, and probably good travel agents. You want their marriage to work. The problem is, it's a facsimile arranged by the KGB and they can't get past that. When times get tough they'd cling to sweet memories of their courtship, but there wasn't one. Facsimile marriages make for interesting drama. The one in The Joneses was created to fool the neighbors. The one in The Truman Show was created to fool the husband. I guess the one in The Americans was created to nudge along the collapse of the capitalistic West, though no one on either side seems to consider that a remote possibility—by this time the cold war is a war no one can remember why they're fighting. But on the screen these pretend marriages all raise the same questions about appearances and reality, what the difference is supposed to be, and, when the appearances are nice enough, how smart it is to rock the boat. We know the Jenningses aren't going to destroy the West or even make a dent in our way of life—and they obviously know it too. So we wish the best for them and hope they work things out. Meanwhile, Beeman has his priceless informant inside the Rezidentura and the Jenningses have a priceless bug inside Secretary of Defense Caspar Weinberger's study. Everyone's spying on everyone else. But . . . But as the season ends the informant and the bug are both revealed, not that the other side knows it yet! So we can be sure that in season two, more misunderstandings, reversals, and high jinks will ensue. And did I mention that Philip, wearing a ridiculous wig, just got married because his oblivious bride has a job that makes her a gold mine of information? Elizabeth is good with the marriage. It was his little desperate fling in New York—which he lied about—that made her throw him out of the house. I can't describe this plot without my imagination hearing boudoir doors slam open and shut as dissipated nobles shove nubile maids under beds. The creator of The Americans is Chicago's own Joseph Weisberg, a former CIA officer who's a son of the legendary Lois Weisberg. Lois Weisberg, who used to be Mayor Richard M. Daley's commissioner of cultural affairs, was made a legend in 1999 by the New Yorker's Malcolm Gladwell, when he published an article, "Six Degrees of Lois Weisberg," that asked the question, "Why is it . . . that these few, select people seem to know everyone and the rest of us don't? And how important are the people who know everyone? This second question is critical, because once you begin even a cursory examination of the life of someone like Lois Weisberg you start to suspect that he or she may be far more important than we would ever have imagined—that the people who know everyone, in some oblique way, may actually run the world." Philip and Elizabeth Jennings are just the opposite. They're a power couple who get around and know all sorts of interesting people—big-shot generals in Moscow, Caspar Weinberger's maid, the head of the Jamaican tourist council (I'm guessing at that last one)—but wouldn't dare ask them all to the same party. What a way to live! That's why I hope the cold war and the series end with the Jenningses and the Beemans throwing a barbecue together and inviting everybody.